I know it has been a little while since I have written over here, but with Opening Day for the St. Louis Cardinals less than one week away, I figured I should check in with you all and let you know what I have been up to lately in the Cardinals blogosphere. First and foremost, I have written a ton of posts over at Viva El Birdos since you heard from me last, and I really hope you have been able to check them out. If not, I will include links to five of the posts that I really enjoyed writing, including two that were reference by Bernie Miklasz (scroll to the bottom) of the St. Louis Post Dispatch (also near the bottom). 1. Should We Think Twice About Aledmys Diaz? Enough about my writing, let’s talk about something we can participate in together now that the season is about to begin–fantasy baseball. I already participate in a season-long league on Yahoo! with some other Cardinals bloggers, but that can get long and tedious. Well, I have been seeing ample amounts of FanDuel commercials all over TV the past few weeks, and it really sparked my attention. FanDuel provides fans with a chance to play in one-day fantasy sports leagues which is pretty awesome for someone with a busy schedule like me. Thus, let’s play some one-day fantasy baseball together this season. Email me at stlcupofjoe [at] yahoo [dot] com if you are interested, and we can figure it out together. I look forward to hearing from you. P.S. Who wouldn’t want to try out a product when they directly respond to you on Twitter without even asking them their opinion? 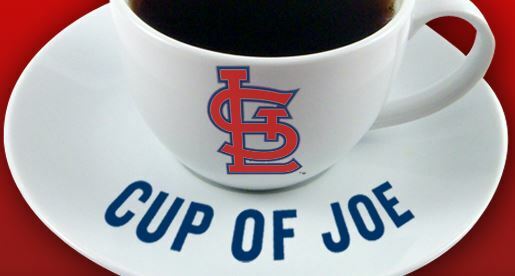 @stlCupofJoe We’ve got some experience with it…. we think it’s pretty great. Check us out! I really hope all of you are doing well and hope to hear from you over at Viva El Birdos sometime soon! Hypothetically speaking, what does the future hold for Brad Stevens?